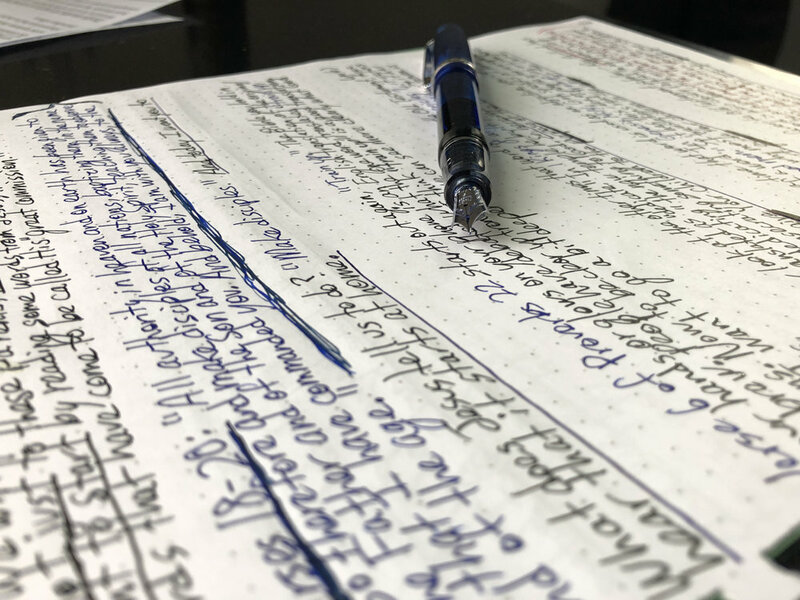 You may have noticed, if you’re read my blog before, that I’ve transitioned to writing my sermons out by hand. Recently, I came across a couple of articles and videos featuring preachers I respect who handwrite their messages. I’m not sure that they write a full manuscript, as I do, but they write extensive, handwritten notes. I love my fountain pens. I genuinely enjoy using them. I thought, “What would happen if I stopped typing up my messages, if I stopped using my iPad in preaching?” I decided to give it a try. Here a few things I’ve learned after having attempted the practice a couple of weeks. This won’t surprise you, but it takes significantly longer to prepare a sermon. Part of the problem, at least for me, is that I’m a really fast typist. I’m talking almost one hundred words per minute fast. Writing out messages long-hand, and especially printing them, as I do - for legibility - takes significantly longer. I find writing out long-hand results in fewer revisions. I’m sure part of it is that it’s so much work to write it all down again! However, I think the real reason may be that the writing process goes better when I slow down and thoughtfully craft my points. I take more time to choose words and formulate my sentences. I do far better in writing for oral presentation. It’s easy, being fast on the keys, to construct long, wordy sentences. This isn’t as much of a problem when I’m thinking through each word and slowly putting pen to page. This is the main benefit I’ve found in this new practice. When I stand in the pulpit, my message is far more internalized than it has been in the past. I think this comes from the process of writing the message down, along with marking it up by hand. It was this possibility that led me to try this practice in the first place. In conclusion, I’m unsure how long I’ll continue. It really is a lot of work. I have, however, seen some benefits of handwriting my sermons. I’ll keep you updated as to where I land.